DALLAS (AP) — United Airlines moved to staunch criticism — and any customer defections — by reaching a settlement Thursday with a passenger dragged off one of its planes two weeks ago and issuing new policies designed to prevent similar customer-service failures. On April 9, Kentucky physician David Dao was forcibly removed from a flight after refusing to give up his seat to a crew member. The incident ignited a debate about poor service and a lack of customer-friendly policies on U.S. airlines. The CEO of United Airlines acknowledges he "messed up" with his initial response to the April 9 incident where a passenger was dragged off a plane after refusing to give up his seat. United issued a report Thursday about the incident on a United Express plane, and detailed several new policies to deal with overbooked flights, including increasing the amount of compensation that can be offered as an incentive so passengers volunteer to be bumped off an overbooked flight. An Iowa man who was getting a giant rabbit from Britain for his boss to show at the Iowa State Fair says "we're still in the mourning process" after hearing that the animal died en route. CAMBRIDGE, Mass. (AP) — Officials in a Massachusetts city are trying to ban employees from using public funds to fly on United Airlines after a passenger was dragged off a flight in Chicago. The Boston Globe reports (http://bit.ly/2pipih0 ) the Cambridge City Council passed a proposal Monday asking the city manager to ban official city travel on the airline so long as there are alternative options. 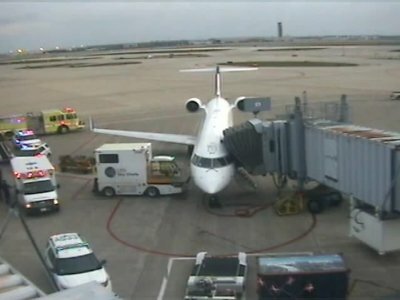 HOUSTON (AP) — United Airlines says a flight from Costa Rica to Houston was cut short by an engine-overheating warning. Airline spokeswoman Erin Benson says the two-engine Boeing 737 circled to burn fuel, then returned Monday to the airport in Liberia, Costa Rica. She says the plane was over normal landing weight, so fire crews stood by at the airport. A reporter among the 165 passengers tweeted that it was a frightening experience. CHICAGO (AP) — The physician who was dragged off a United Airlines flight in Chicago this month was verbally and physically abusive, and flailing his arms before he lost his balance and struck his mouth on an armrest, according to the aviation officer who pulled the man out of his seat.